“Local and state financial problems are accelerating, in large part because public entities promised pensions they couldn’t afford. “Citizens and public officials typically under-appreciated the gigantic financial tapeworm that was born when promises were made that conflicted with a willingness to fund them. “Unfortunately, pension mathematics today remain a mystery to most Americans. As I explained in yesterday’s Roadmap, we are already starting to see some of that bad news hit the tape. In the case of public pension plans, Buffett is absolutely right about both the cause – inept lawmakers making promises in a vacuum — and the future effects — financial pain for millions. Plus, once you add in the additional problems at many private pension plans, the overall impact grows exponentially. First, if you are collecting a pension — or you expect to in the future — this situation could dramatically affect your comfort in retirement. And I have other friends and family members who are also counting on retirement promises made by various politicians. I also know plenty of people who collect checks from private pension plans. My message to all of them is the same: Hope for the best, but plan for the worst. There have already been some attempts by state and local governments to alter the retirement benefits they are contractually obligated to provide. I believe we have only seen the very beginning of the trend. Likewise, some corporate plans have already failed. Others are in jeopardy of doing so in the future. And as I explained yesterday, the PBGC — which is a governmental backstop for these plans — is also on very shaky financial ground. Current and future pensioners could see their benefits reduced in a number of ways. This includes the discontinuation of cost-of-living increases as well as increased charges for any healthcare services provided by their plans. Under a law that passed in 2014, pension plans can even make outright reductions in the amount of payments paid out to retirees if that’s the only way to stay afloat. 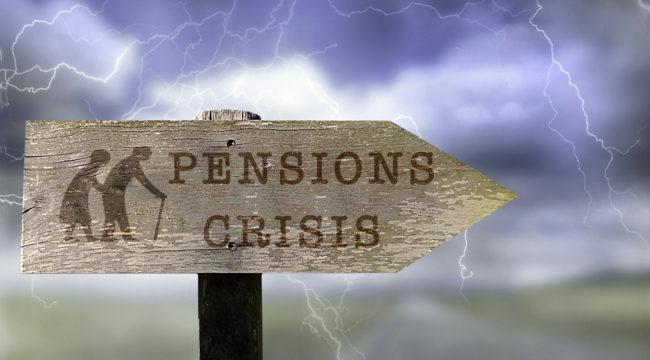 Of course, even if you’re NOT connected to any type of defined benefit pension plan, please realize this issue will affect you anyway. At the end of the day, some of this is going to hit taxpayers. For example, do you live in a state or municipality with a struggling pension plan? Odds are good you’ll end up paying for the promises made by your local politicians over the last several decades. It also fairly likely that the federal government will end up involved in many of these blowups down the line. That will essentially make all U.S. taxpayers somewhat responsible for those same irresponsible decisions. We may even end up footing the bill for some of the failing PRIVATE pension plans. Especially since the PBGC’s multiemployer fund is in such bad shape. In fact, according toThe New York Times, this is already being discussed in Congress. A committee is exploring possible taxpayer-funded bailouts of 200 different private pension plans despite very reasonable arguments that there are many dangers in doing so. Wherever you come down on the issue, I encourage you to reach out to your representatives to make your voice heard on the matter. You should continue building your own private nest egg aggressively so that your family always receives enough income to support the retirement lifestyle you deserve. For the bulk of your money, I continue to recommend a good mix of dividend-paying stocks and other income investments like bonds and preferred shares. It’s simply a matter of deciding what particular percentages make the most sense given your age and tolerance for risk and then sticking to your plan. Heck, even if you simply stockpile cash year in and year out, you’ll be better prepared than most Americans! You should continue reducing your current and future tax liability through every legal means available. I’ve said it plenty of times before, but there is perhaps no better way to build your wealth than limiting the massive drag created by taxation. And with the wide availability of 401(k) plans, IRAs, and other common shelters, you do not have to resort to exotic strategies to limit the amount of money you fork over to governmental agencies. You just need to learn which types of shelters make the most sense for your retirement, and then using them religiously. Doing so will not only help your nest egg increase as efficiently as possible, it will also ensure that you protect as much of your wealth as possible from the inevitable damage caused by lawmakers’ poor decisions. You should always view promises or financial forecasts made by politicians with extremely skepticism. There’s nothing more frustrating than seeing lawmakers continue writing checks their butts can’t cash. But unfortunately, that’s simply the game being played by a lot of people in Washington and our country’s state capitals. Whether you’re talking about unrealistic pension promises or the continued coverup of our worsening Social Security system, most elected officials will continue doing and saying whatever is best for their careers regardless of the longer-term consequences. Instead, get the facts from unbiased sources and start taking actions to protect your own family to the fullest extent possible.